I love The Lyons Farmette in Lyons, Colorado. Just outside of Boulder, sits the most adorable farmette that has vegetables, goats and chickens and they host a slew of classes, farm dinners and events at their beautiful community land and space. They involve and engage so many local artisan, farmers, chefs and producers it is a true circle of celebration right on the land. I’ve attended two farm dinners there before and recently, took part in one of their cheese making classes where we made mozzarella and ricotta (the good, “easy” cheese to start to make). 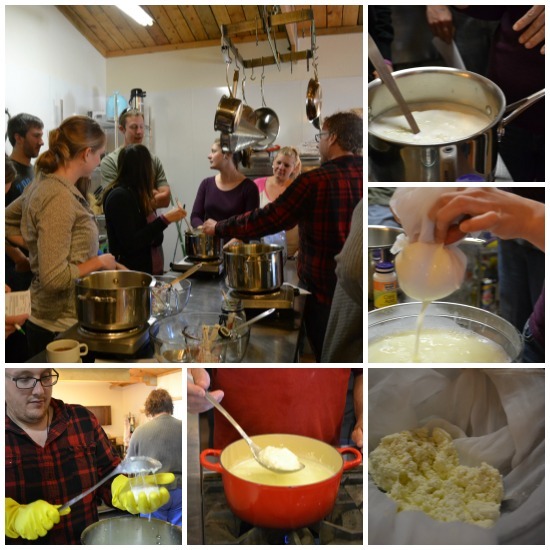 Taught by Hilary Van Dusen, previously a cheese maker at Haystack Mountain Goat Dairy, the morning was filled with knowledge, applicable cheese-making and of course, tasting the results. If you haven’t made cheese before, the basics are easier than you might think. It’s incredibly rewarding to make your meals and food from scratch and cheese is no exception. If you’re interested in other classes at The Lyons Farmette, I highly recommend them. They range from dutch oven cooking, to beer brewing, to flower arranging to seed saving. You can learn more about their classes here. I’ve included (with my notes) Hilary’s recipe for ricotta. As you can see, it’s straight forward and there are still ways to play around with the texture, creaminess and softness of the ricotta as you become more of an expert. As Hilary shared, ricotta is often the cheese you make when you mess up other cheese. 1 gallon whole milk. We used Morning Fresh from Colorado that you can pick up at Whole Foods and be sure it’s non-homogenized whole milk. A good rule of thumb is that 1 gallon of whole milk makes about 1 pound of cheese. 1 teaspoon citric acid dissolved in 1/4 cup cold water. If you’re planning on making cheese, you can buy a little bottle of this and have it handy. You can find it at Vitamin Cottage in the sprouting section. 1-2 teaspoons of cream (optional). We opted for something a little sweeter and creamier, so we included the cream at the end. Personally, I think it’s lovely. You will also need a thermometer that can go from 0 to boiling. They’re available at Bed Bath & Beyond or you can order them online. Do not use a meat thermometer. The cheese cloth suggestion was butter muslin which you can re-use overtime. Pour the milk into a stainless steel pot (aka soup pot) with the heat on high. Add the citric acid and salt, and begin to mix well. Be sure to continually stir, but not too furious. Keep your thermometer nearby and check for the heat. When it gets to 170 degrees Fahrenheit you can turn down the heat slightly. You’re looking to get your heat between 185-195 degrees Fahrenheit. You’re looking for a yellow-ish color as the heat increases. When curds and whey separate (which you can literally see as it comes off your stainless steel spoon), pull off the heat and let it sit for 10 minutes. During these 10 minutes, do not stir! Line a colander with cheese cloth and spoon the curds into the cloth. Tie the cloth together and let it drain for 20-30 minutes until you have the consistency you want. We let ours sit for only 10 minutes as we wanted to keep it soft.